Annual dianthus tolerates light frost with ease, but can be damaged by hard freezes. 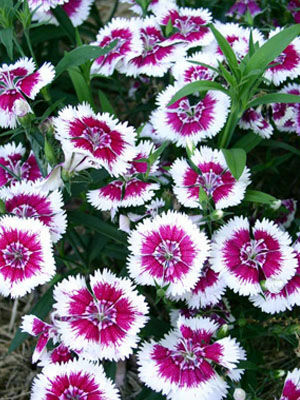 Where winters are mild, dianthus can be grown as a winter annual. Thyme and Portulaca. Dianthus combines well with other cold-tolerant annuals including pansies, dusty miller, and ornamental cabbage and kale. Set out stocky seedlings in early spring, or in fall where winters are mild. Dianthus blooms earlier than other annuals, and well-sited plants may persist for two years in climates with mild winters. Colors include pink, red, lavender, white and many bicolors.